The first is a two part series on making a fenced rabbet plane remarkably like the French planes in Roubo. It is in Chinese, which I don't understand, but I bet one could make this plane without understanding the language. I also love his work holding. It turns out he has a channel, and there are several videos with different projects on it. The second is in Japanese. I don't understand this language, either. I have been experimenting with the burnt wood finish inRaney's article in the April issue of Popular Woodworking. I was interested in watching the Japanese do it. I think they use cedar, and they use a tool very much like a pollissoir. This has to be one of the ugliest planes I've ever seen. This plane will win no beauty contest. Last year while building chairs with Mulesaw in Denmark, Jonas' parents came to visit one day to see all the commotion. Jens also brought along a trunkload of vintage tools from his frequent visits to Sweden. Many of those tools followed me home. Jens and Jonas. The Swedish Hoarde is on the bench. In this pile of tools were a ratty old jack plane, and a somewhat nicer try plane. Both beech, and both with EA Berg double irons. My intention was to rehab these planes one of these days and see if I could use them. Nothing happened because I like my Veritas BU Jack so much and I never really needed these planes. They sat collecting dust waiting for me to someday get to them. To make this long story even longer, I have been watching David W.'s series about building a wooden try plane. I wound up with a ginormous slab of quatersawn 12/4 beech the last time I was at the lumberyard, so this project has launched itself in to the "do soon" category. 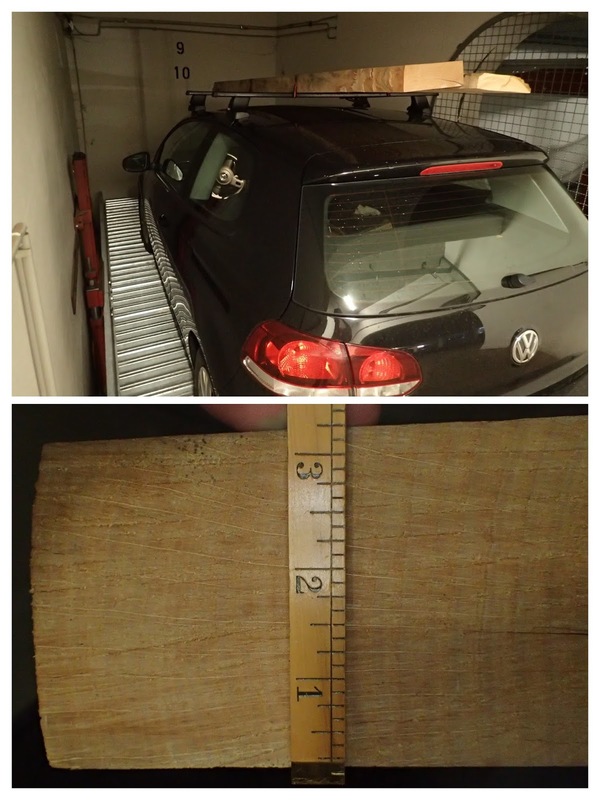 12/4 beech on the roofrack of a VW. That's not something you see everyday. I have been psyching myself up to build a wooden jack plane, and maybe a try plane because it looks like a fun project. David W. makes a good case for them. Honestly, I really want to try one (get it? "TRY one."). In the meantime, my list seems to add three projects every time I finish one. While I was working on tapering some ash legs for a staked desk, I was thinking about the thick shavings I saw on YouTube with that wooden jack. The other day, I got as far as tapering my foursquare legs to a tapered shape on one leg, and two sides of another before I was worn out with my BU jack. Today I wanted to finish that up, and maybe get some octagonalizing done on them. I had forgotten about this little wooden jack plane until I saw it when I walked in my shop today. I thought, "Huh! It's too bad I didn't rehab that plane already or I could use it for this project. Perhaps I'll just see if the iron could be sharpened quickly and see what this thing can do." Instead of that, I gave the iron a couple taps in the mouth of the plane to set it to a course cut to see what it would do. A shaving in the mouth. HOLY CRAP THIS THING CUTS FAST! I would break my arm making shavings this thick with my BU jack. Jens must have sharpened this thing before he brought it over for me to look at. I can't believe how well it works. It feels light, is easy to push, takes incredibly thick shavings with no tear out (unless going really bad against the grain), and made quick work of tapering the rest of the desk legs. I actually finished the whole job of tapering the rest of the legs without ever taking the blade out to sharpen. I think the double iron forgives a multitude of sins in this matter. The mouth of this plane is a little different than an English or an American plane. Everything is very triangular, but I suppose it works. The plane is 20 inches long and has a blade 2 1/8 inches wide. Here is a view of the mouth. You really can't see anything in this photo. I think you still can't see anything of worth. This plane looks like it was made from a rejected piece of firewood. The annular rings go at a 45 degree angle to the plane, rather than quatersawn, like a quality plane would. Can you see the annular rings? The bed looks like someone thought it would be fun to plane a board with a nail in it. Over and over again. The mouth is wide, as expected, and there is a big chip in the back of the mouth that is just cosmetic. In fact, the whole plane is a cosmetic disaster. You can even see rays in the grain on the sole! The rest of this plane looks like it fell in a garbage disposal. Maybe they thought they could set the wedge with a felling axe? I have fallen in love with Swedish steel lately, and was happy to see this Shark logo on the blade. If you can see through the rust, there is an EA Berg logo there. Cosmetics aside, this plane works well. 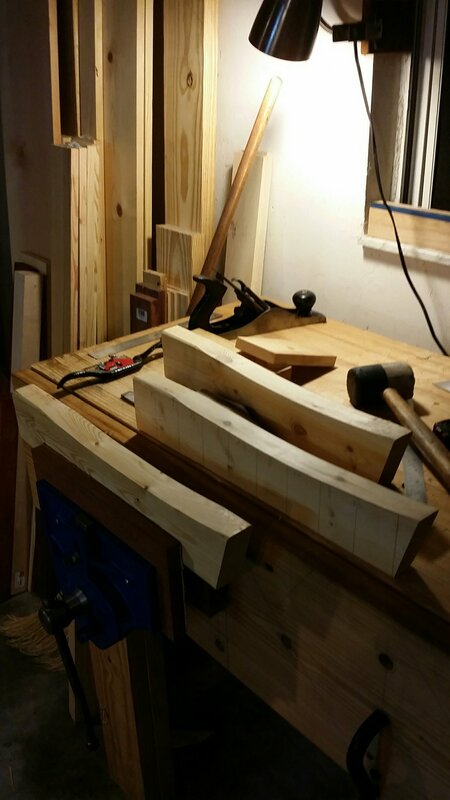 I was able to finish tapering the desk legs with far less effort than I did with the BU Jack. Don't get me wrong, I love my BU jack, especially the versatility of the plane. But, this old woodie does the one thing a jack plane should - remove a lot of wood fast. I don't think I would use this one for shooting, or smoothing, jointing or any of the other things that the BU jack does pretty well, but for a single purpose tool, this one nails it. I used it to taper these legs. Just to see if I could do without my BU jack, I got out my old Krenov jack plane to finish the tapers and the octagons. I made this Krenov jack plane a couple years ago, but it doesn't get much use. This plane, unlike the vintage jack, is optimized for very fine shavings. Next time, I'll know better. It actually makes a good partner with the vintage jack. Rough off the bulk with the rough plane, and this one smooths and joints in one fell swoop. At least good enough for staked legs. Finished tapered octagonal desk leg. The moral of the story is, if you find an old, ratty jack plane, rather than let it go for firewood or something to screw to the wall at AppleBee's, try it out first. You might be surprised. 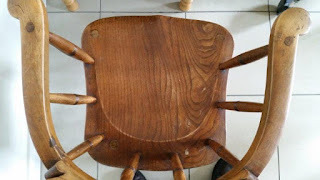 I took some photos of a nice Irish chair at my Mother-in-Law's house to share with you! There are a couple cool things to note about this chair. 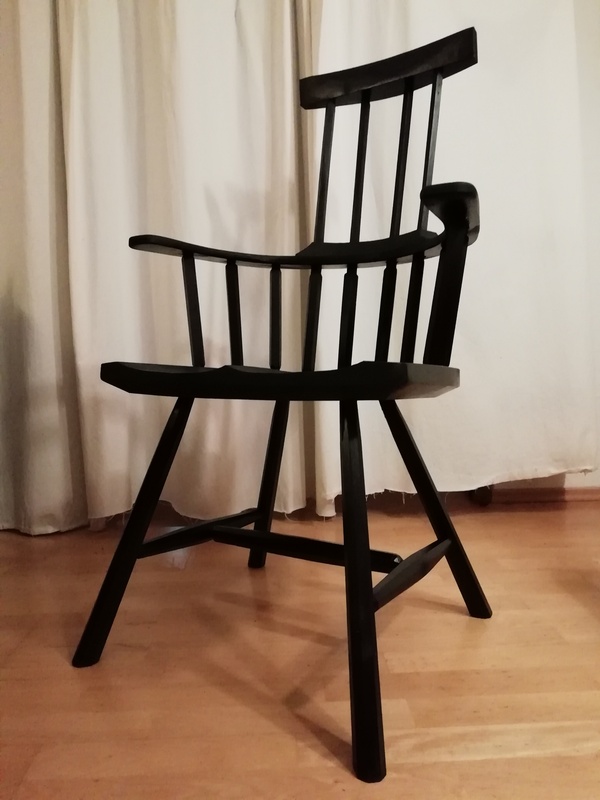 First, it indeed is a true Windsor chair, i.e. a solid seat plank with everything else growing from that. 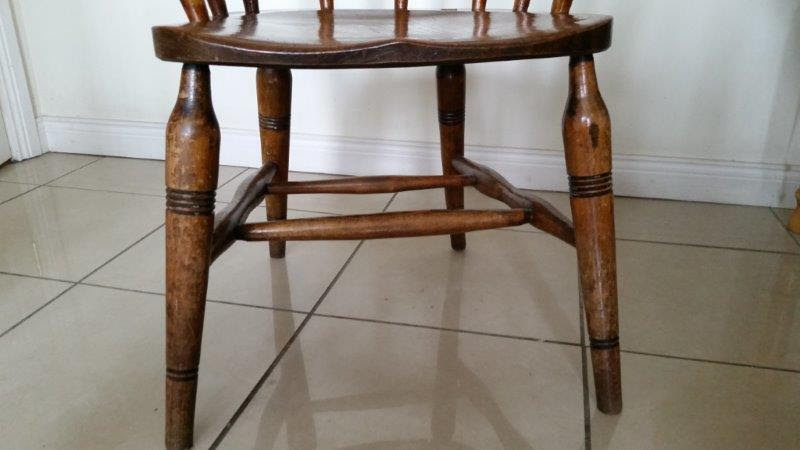 The legs and spindles all pierce the seat, probably with a tapered tenon. I bet it's rock solid. Second, the seat plank is made up of a single, wide board as opposed to several narrower boards glued up to make a wide enough plank. I would guess that this is an indication that the chair is very old. A newer chair (especially one that was made for the masses as opposed for the wealthy) would have used a laminated seat blank. It has been a very long time since it was more economical to save the labor and use a single seat blank as opposed to now, when the labor is minimal compared to the expense of a wide board. I wonder what kind of wood it is? It looks like the seat could be elm or ash, and the arm bow something else like maple or sycamore, but really they could be anything. 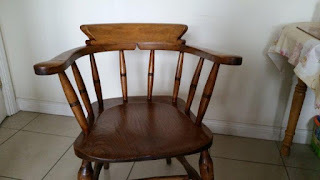 Third, the legs (especially the front legs) are more upright and pierce the seat near the edge - this is very much in the English tradition, as opposed to the Welsh, and John Brown thinks this makes for a very ugly, blocky look. Who can say, but it was very popular to do that in certain regions. If I had to guess, I would say this chair was made in a factory. 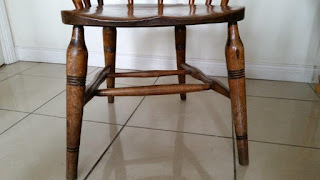 The legs and spindles were all turned on a lathe, and have very simple ornamentation, indicating this is more of an "everyperson's" chair as opposed to a fancy one intended for the rich. One of the neat details of this chair is the shaped cutout on the arms directly in the back. It makes for a nice look, and simplifies the lamination of the arm bow somewhat, as the joint doesn't have to be tight or anything, there is a gap that is clearly intended. The crest is glued on top and holds everything secure. What a neat shape - very distinctive and unique. Note that only the front posts on the arms actually pierce the arm rail. That is because those take more stress than the other sticks in the back. Often, these posts are bigger or shaped different than on other chairs for exactly that reason. I think it interesting that the others don't pierce the arm rail. It could be that they are just trapped loose in there and aren't really providing strength. I would have to examine it in person. The wedges on all of the piercings go the same direction - left and right. That is because the grain of the wood goes fore and aft. The wedge doesn't work to split the wood, it uses the strength of the grain to hold the tenon tight. 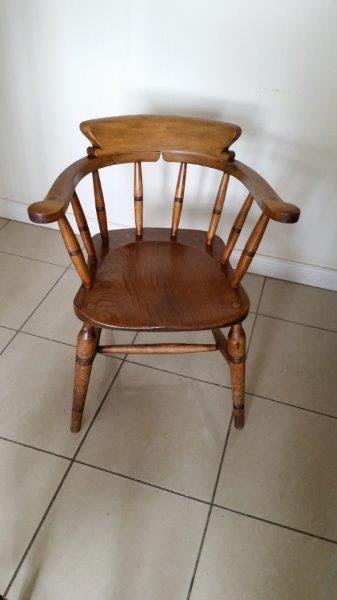 Also, it is normal in the UK for Windsor chairs to be finished natural, where in the US this type of chair is painted more often than not. Is there a story with this chair? Does your mother in law know how old it is, or how she came by it? It would be neat to see the underside of the seat. It also would be neat to see if there is a maker's mark on it anywhere. So how about it, dear readers? Is there anything you notice about this chair? 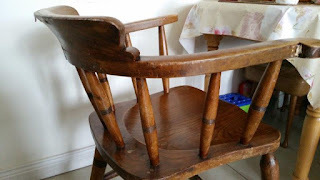 I think it is a neat example of a chair that is still in use after who-knows-how-long.